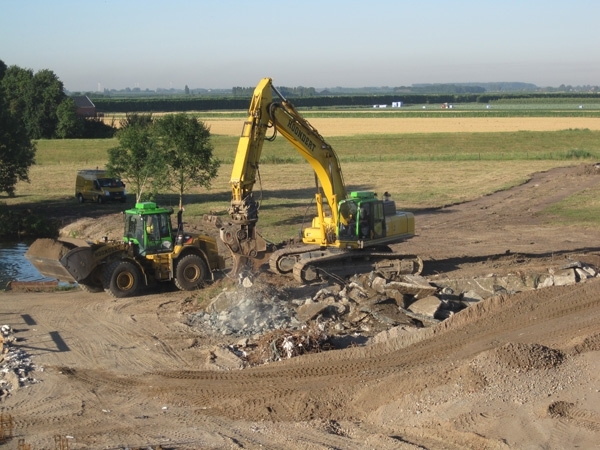 Recycling – Hoondert Groep B.V.
As demolition and civil-engineering expert, we are often faced with the phenomenon of recycling. Not only does recycling avoid huge mounds of waste material, it also allows us to save substantially on primary raw materials. In addition, the synergy that is created among the different disciplines enables a substantial increase of profits and reduction of CO2 emission. Because we demolish very selectively, this results in a substantial reuse percentage of the resulting material streams. An important pillar underneath our recycling activity is the breaking and screening of the stony fraction from construction and demolition waste to BRL 2506 certified products. The most important product is mixed granulate 0-31.5. Hoondert has a number of mobile breaking and screening installations, which enable mobile breaking and screening projects to be carried out on-site. These installations are regularly deployed on location at the Environmental Terminal and the Walcheren Rubble Depot, where we collect unbroken debris from our own works as well as from third parties. This way, we have produced hundreds of thousands of tons of certified mixed granulate to date.